From the moment I tried on these boots I was impressed with how comfortable they are. The Lowa Z-S8 GTX are a multi-function boot. 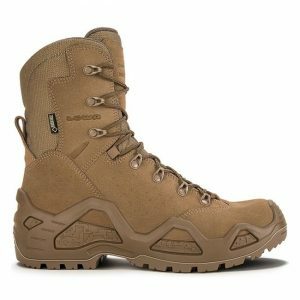 Designed as a tactical boot, for use in varied terrain with the comfort of a light hiking boot. I have spent many years of my life in the infantry wearing military boots in some of the most extreme terrain in this world. I can tell you I wish I would have had these boots. They are durable enough to keep up with the demanding wear and tear that are put on boots by light fighters, and comfortable enough that you will not mind wearing them all day on your feet. I got the boots about a month before hunting season started. I wanted to break them in so I started wearing them to work every day. Now most of my day is spent walking around an office, or sitting at my desk, but I do get to spend a few hours each day out on the project site doing inspections. This is a great way to break in a pair of boots slowly. After 3 days of doing this these boots felt like they were completely broken in. There were no pinch points, they were snug on my foot all the way from the toe box to the top of the 8 inch tall upper, and did not feel stiff or uncomfortable. On the 4th day of owning the boots I was planning to climb the second highest peak in Washington State, Mount Adams, with some friends. I seriously considered putting these boots to the ultimate test so soon after first putting them on my feet. The climb was a strenuous nontechnical climb, and I seriously debated on wearing the Lowa Z-8S GTX boots on the trek. What better way to test out a new boot than to climb a mountain. I have been fooled by boots before thinking they were broken in so I decided to take the smarter choice and wear another pair of boots that I have spent a lot of time hunting and hiking in for the trip. I continued to wear my Z-8S boots to work for another week around the office, home, and any errands I needed to run through out my day before being fully confident that they were broken in well. I never had the uncomfortable time with these boots that typically happens with a new pair when you first wear them. That period where they feel stiff, don’t hug your foot right, rub on the ankles and various other spots on your feet. The Z-8S felt more like a comfortable shoe from the beginning. I didn’t mind wearing these boots for 10-12 hours a day. The 2 mm thick split leather and Cordura upper and PU Monowrap midsole construction keep the boot very lightweight. 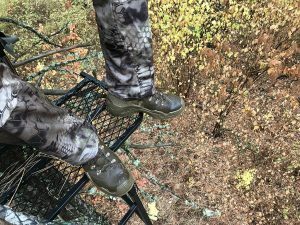 To increase my confidence that they were fully broken in, I wore them on a few light hikes prior to archery season opening where they would get fully put to the test. The hikes were ususally no more than a mile or two checking on my tree stands and cameras. When the season opened I was 100% confident in my footwear. I knew that my feet were going to be taken care of, and i was not disappointed. 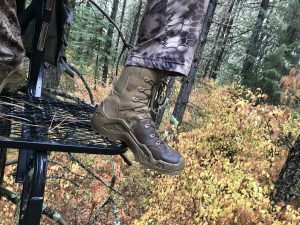 I wore my Lowas first through archery deer season, switching between my lowland stand and my mountain tree stands putting the boots through some varying terrain. They kept my feet comfortable, dry, and happy no matter what I threw at them. The real test came when archery elk season started. For me, this is when the hiking really starts. I spent opening weekend hiking to the top of the mountains, and then dropping into the bottom of the canyons, side hilling halfway up the the canyon, hiking the thick brush, and open meadows. I put on an average of 10 miles per day on very uneven terrain and I have not one complaint about my feet. A couple of my hunts were even in the rain through the season, where I was soaked from head to the top of my boots. My feet were the only thing dry on my. The Lowa Z-8S boots were great. 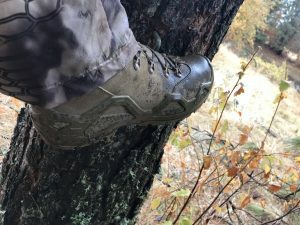 I have never had a pair of boots that I have hiked these kinds of terrain in and not had at least one hot spot throughout the hunt, until now. When climbing hills, the boot hugged my foot perfectly providing the necessary support and comfort. The Lowa Cross Duty sole provided for excellent traction on slippery vegetation and loose soil. The toe box on these provides just enough room to not feel that your foot is being squished, but provides good support to where your feet are not slipping around. The midsole and upper design formed to my foot perfectly providing the support needed and held my foot in place. All to often many boots I have owned do not form well to my right foot, the heel in particular. The boot will have many miles on it, feeling like it is ready for me to take on anything. My foot will slip around and rub on the back of my heel in uneven terrain causing discomfort and blisters. With the Z-S8 my heel never rubbed once. Any time I am headed to the outdoors my Lowa Z-S8 GTX are my go to boots. I am extremely happy with them. They are a quality boot, that performs well under many conditions, lightweight and breathable keeping your feet comfortable throughout using them. I am looking forward to many more hikes and hunts with these boots. I give these boots 5 stars. There is not one thing that I would do differently with them. I was completely happy with them. They are quality made, durable, comfortable, and do everything that I expect from a boot. Johnny is a life long enthusiast of the outdoors. 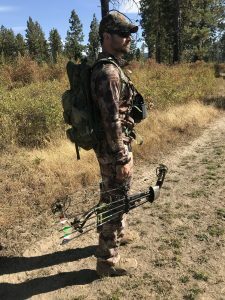 His passion and background have lead him to experience the outdoors from a multitude of adventures. You will typically find him hunting, fishing, backpacking, or hiking somewhere in the world unspoiled. If you liked his review please comment below.